Can you believe that Spring is only three weeks away! We have been very busy preparing our community beds for the new planting season. We bought two metres of improved soil to top up the beds and we are mixing it half-half with macca mulch to make to go further. We also have lots of seeds germinating in the shade house so we will be ready to plant out in three weeks. Any members that have questions about their own garden are welcome to use our large library if gardening books or to come down on a working bee day and ask for info. Michelle is particularly knowledgeable when it comes to soil and she is more than happy to help. If there was enough interest we could organize a workshop at the garden to help members prepare for Spring. 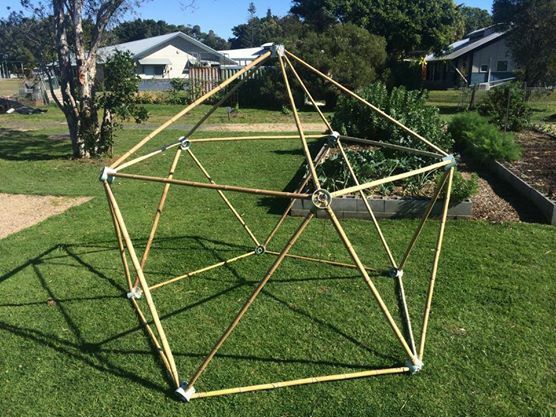 On only his third visit to the garden, Bryan, one of our new members, bought us an amazing bamboo geodesic dome that he had made and we are going to use it as an extra chook run for the two girls that live in the small pen. Thanks Bryan, the girls will be very happy with the extra room. It has been a strange winter season and some crops have been affected. The brassicas didn’t do well at all, most of them are still growing leaves with no sign of flowering. Although, other member’s private plots did ok with broccoli so maybe we need to look at the soil we had ours in. We learn something more about our garden and gardening every season, which is what we are about really. 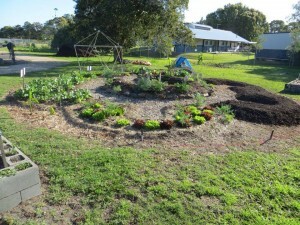 Kevin has finished our permaculture mandala garden down the back and it is fabulous. Have a look next time you are down there. The bananas in the circle are sprouting new leaves and the mandala pattern beds are flourishing. We would like to develop the area down the back there and we were hoping to get input from members as to what to do with the space. It would be nice to try something different in this area, like more permaculture beds. At the moment we have lots of bok choy and lettuce. Thanks to members Graham and Sumarmi for donating so many seedlings this winter. There are also plenty of purple beans ready to pick. We staggered the planting of the potatoes so we are still digging them up. There is usually a bucket or two of produce left out on the table for members who don’t get down to the working bee days so don’t forget to check now and then. We have lots of kale and mustard greens at the moment and still lots of strawberries, although you might have to fight off the birds to get to them. Harvesting the fruits of our labour can be tricky at times, with so many members. On the working bee days we try not to harvest too much as we can’t let all members know what’s there and sometimes it will go to waste. We try to take only enough for our needs and leave lots in the garden (the best way to store it). 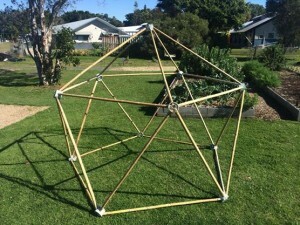 The idea is for members who can’t get to the working bee days to come down when they can and do what they can to contribute to the garden. The weed situation is always in need of attention so even pulling a few weeds from the beds or the paths contributes a lot. Watering a bed or two when you are doing your own private plot helps us all. So don’t forget to check the jobs list on the board to see if there is anything that needs doing and have a look at what we have growing and take what you need. This month we would like to mention our members who are our mowing crew. They don’t often dig or cart dirt or plant in the garden but they work so so hard on keeping our edges and grassed areas looking as good as they do. These same members also run our fundraising B.B.Qs at Bunnings. Good on you chaps we really appreciate your contribution. Hope to see you out and about soon Keith Spearing. Also a big thank you to Troy for bringing us coffee grounds from work, we use it on the compost, the worms and sometimes around the tomatoes. We have applied for another grant to add to the toilet project. If we get this grant we will be very close to getting our toilet. Ballina Shire Council recently informed us that they will grant our request to supply the sewerage connection for our toilet which will save us a huge amount and get us closer to our goal. A big thank you to Council for their support! At our recent committee meeting we decided we would like to have a Spring social afternoon. Just a BBQ, a chat and a chance to get to know each other better. This could be a great opportunity to get members input into the garden and how we are going as well as new ideas for the future. We thought a Sunday afternoon after the working bee would be good. A preliminary date of October 12 was suggested. September would have been nice but lots of children’s sport finals are on as well as school holidays and we would like to have as many members and their families present as possible. More details to follow.